There is no question that for industrialists, the Letchworth boys had a sensitive and creative side. Not only did Mr. Letchworth enjoy literature and dabble in some creative writing of his own - his youngest brother Josiah was a published poet! 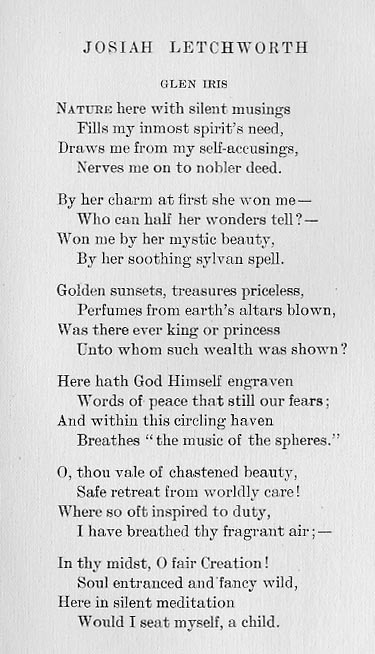 We believe the first published poem may have been the "Glen Iris" which first appeared in the Voices of the Glen, a book of poetry related to the Glen Iris Estate. 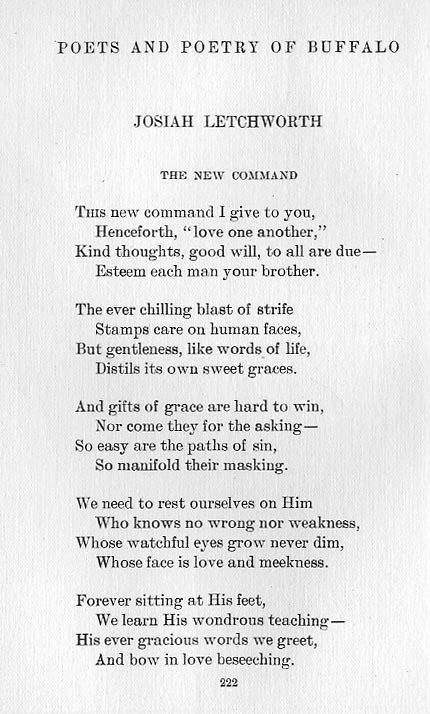 In 1904 the poem along, with another entitled "The New Command" was included in a collection entitled "The Poets and Poetry of Buffalo" edited by James N Johnston. Both poems give us a glimpse into the minds and hearts of the Letchworth Family. "The Poets and Poetry of Buffalo", edited by James N Johnston, Buffalo NY: The Matthews-Northrup Works, 1904.